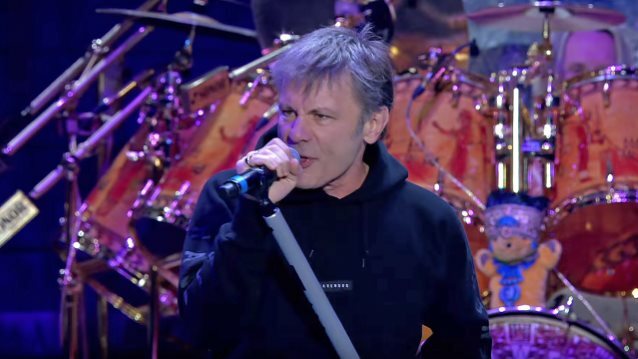 Bruce Dickinson says that the long-awaited follow-up to his 2005 solo album "Tyranny Of Souls" will likely include a reworked version of "If Eternity Should Fail", the opening track on the latest IRON MAIDEN disc "The Book Of Souls". During the press junket for "The Book Of Souls", Dickinson revealed that he had about "half" of his seventh record already written and he also confirmed that "If Eternity Should Fail" was originally penned as a Dickinson solo track. On December 5, Bruce told Finland's Kaaos TV that there are still tentative plans for him to resume work on his new solo album. "I just need to go and get some time and go and write some more material," he said (see video below). According to Dickinson, the original plan was for his next solo record to be "a whole concept album, which was gonna be called 'If Eternity Should Fail'. And 'If Eternity Should Fail' was the title track to my new solo album," he said. "And a bit like [Dickinson's 1989 solo song] 'Bring Your Daughter To The Slaughter' [laughs], it got commandeered for IRON MAIDEN. So if I did do another solo album, which I think I will, I might just stick to my original plan and have that as the title track. I mean, I did write it — it was the first track that I wrote for it. So, yeah, I'd probably still include that song. But it would be… the feel would be slightly different — not very much, though — from the MAIDEN version." Back in 2015, Dickinson told France's Hard Force magazine that "If Eternity Should Fail" ended up being used by IRON MAIDEN after bassist Steve Harris heard the demos that Bruce was working on for what was supposed to be his next solo album. "And [Steve] went, 'That's a really cool song. Can we use that? That's gonna be the opening song on the album,'" he recalled. "And I went, 'Yeah, okay.' And he was already writing, I think… He was already thinking of 'The Book Of Souls' as being the title, so he told me about the Mayan thing. And I'm, like, 'Yeah, that's cool. Okay. Yeah, I see where you're going.' But in my case, that song was written as part of a story. So the spoken word at the end is the beginning of a story that goes through the whole album. And one of the characters is Dr. Necropolis; he's the bad guy. And the good guy is Professor Lazarus; he raises people from the dead. So that introduces Necropolis in the spoken-word thing. And I asked Steve… I said, 'Look. Okay. I get having the song…' 'Cause it opens up with, 'Here is the soul of a man.' 'Yup. Get that. But what about the end?' I said, 'Will people understand what this is about? Because this is nothing to do with the Mayans or anything. This is to do with… I'd come up with a concept album that doesn't happen.' [Laughs] And he [went], 'No, no, no. It's just talking about souls and everything, and it sounds great.' I went, 'Okay.' [Laughs]"
Dickinson made his recording debut with IRON MAIDEN on the "Number Of The Beast" album in 1982. He quit the band in 1993 in order to pursue his solo career and was replaced by Blaze Bayley, who had previously been the lead singer of the metal band WOLFSBANE. After releasing two traditional metal albums with former MAIDEN guitarist Adrian Smith, Dickinson rejoined the band in 1999 along with Smith. Since then, Dickinson has only released one more solo album (the aforementioned "Tyranny Of Souls") but has previously said that his solo career is not over.